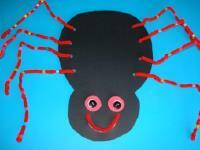 Tiny fingers will be hard at work creating this spider's colourful legs! 1. Gather your material. 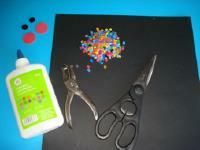 You will need black construction paper, two Fun Foam circles, two dark buttons, white glue, red pipe cleaners (not shown), a hole-punch, and colourful beads. 2. 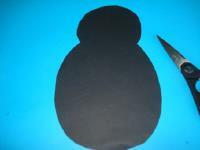 Cut a spider body out of the black construction paper. 3. 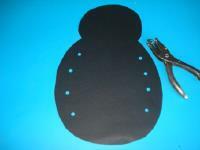 Use the hole-punch to make four holes on either side of the spider's body. 4. 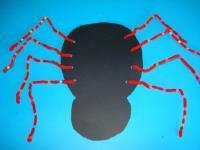 Thread a pipe cleaner in each hole to represent the spider's legs and twist them to hold them in place. 5. 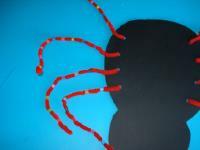 Slide a few colourful beads onto each pipe cleaner to add a touch of color and develop fine motor skills. 6. Bend the spider's legs as shown. 7. Glue the two Fun Foam circles on the spider's face. 8. 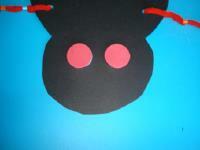 Glue the buttons on the Fun Foam circles to complete the eyes. 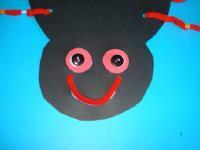 Cut a 3-inch pipe cleaner piece and bend it to create a mouth shape. Glue it under the eyes. 9. 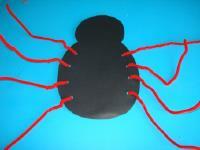 Hang the spider from the ceiling using elastic thread. Children will love to make it bounce up and down over and over again!